It’s not often I’m rendered dumbfounded. However, today it occurred. I had an very interesting mail from one of the longest-serving friends and contributors to The Brownhills Blog – Lisa Downes. 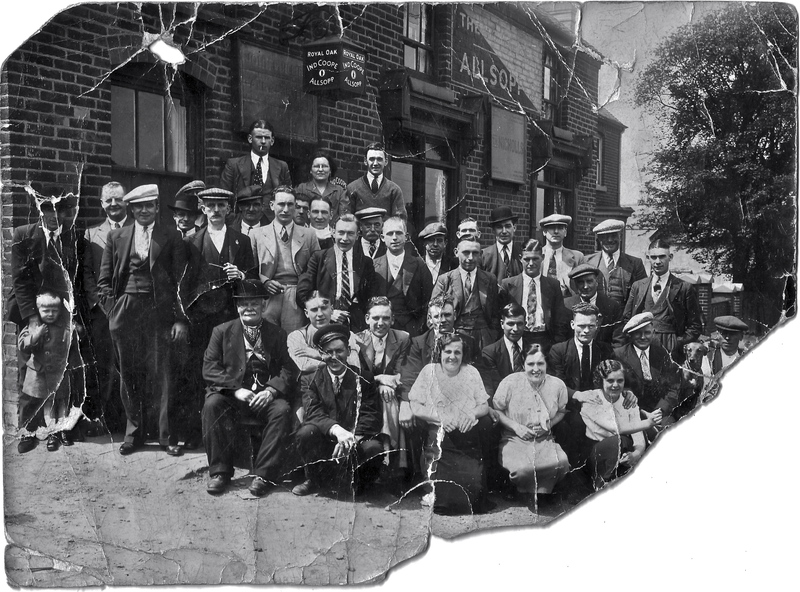 You may remember that on new year’s day, I posted a remarkable find by David Evans, a picture of a happy-looking crowd outside the Royal, or Middle Oak in Shire Oak. The picture, kindly offered for use by Daryl Preston, had, I think it’s fair to say, seen a bit of wear and tear. Ubenknown to me, Lisa is a keen digital photo restorer, and she got to work. The result is shown at the foot of this post. I think all will agree, it’s a remarkable bit of craft. I’ll go further; it’s stunning. 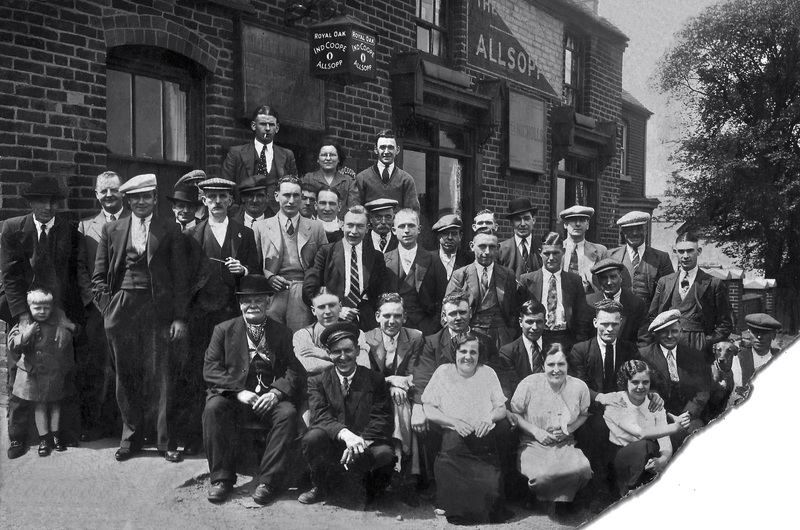 I hope you don’t mind but I took the liberty of cleaning up the photo of the Royal Oak pub which you posted on your site a few weeks ago. Cleaning old photos is a passion of mine and I couldn’t resist having a go. Although it was a bit tricky (recreating the little boys legs and a few bricks being the most challenging parts) I’m must admit I’m pleased with the results. If you want to post it on your site I’m happy for you to do so. At some point in the future I would like to send you some old family pictures which I have restored, that’s if you don’t mind as I would be grateful if you could post them on your blog. I’m having a bit of trouble tracing some of the members of my family tree and I am hoping that your blog readers may be able to help me, as I know some of them have a good knowledge of old Walsall Wood where my family lived. If you or your readers have any old pictures which need any help, I’d gladly have a go at restoring them. Lisa, I would be delighted to feature your photos here, and put up any queries you may have. I’m sure the Walsall Wood contingent will be happy to help – and don’t forget there’s more than one keen genealogist amongst the readership, too. Please don’t hesitate to contact me whenever you like. For anyone interested in contacting Lisa for her remarkable photographic restoration skills, just drop me a line and I’ll supply contact details. Cheers, Lisa, fair made my day, that did. A remarkable and very skilful restoration by reader and contributor Lias Downes. I’m speechless! And the somewhat damaged original. What a fine job Lisa has done! This entry was posted in Brownhills stuff, Environment, Features, Followups, Fun stuff to see and do, Interesting photos, Local History, Local media, Reader enquiries, Shared media, Shared memories, Social Media, Walsall community, Walsall Wood stuff and tagged 1915, Brownhills, Brownhills local history, Daryl Preston, David Evans, gathering, group photo, Lisa Downes, Local History, Middle Oak, New Photos, old photo, Philips, Photo restoration, Pubs, Royal Oak, Shire Oak, Staffordshire, Walsall Wood. Bookmark the permalink. Wow! I’ve done a bit of this myself, as a ham-fisted Photoshop user, and I can see that the amount of time, care and skill that have gone into this is hugely impressive. If you have the facility to do so, compare the old and new side-by-side, it really does make for remarkable viewing. Great work Lisa. fabulous! Lisa, I look forward to your other photos in due course and hope that the Wood’s readers can help in any way. Thanks for the lovely comments. I’m pleased that you all like it. Great job on the photo Lisa, well done.